AV Cable for N64. 3 RCA composite signal (red/white: audio, yellow: video). Moulded Nintendo video port plug with strain relief. Compatible UK PAL Nintendo consoles. 3rd party product, not an official Nintendo item. ☆ Compatible for Nintendo N64. ☆ Provide composite video and audio output for viewing on a TV or monitor. ☆ Cable length:1.8m. This RGB AV cable is exclusively for use with Nintendo 64 console. 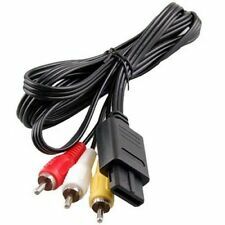 This is theRGB HDTV AV High Definition AV Cable for Nintendo 64. For use with Nintendo 64. SmartPhone Accessories. Enables displays with natural and VIVID Colors. Connects for N64 console to TV and transfers A/V signals from for N64 to TV. 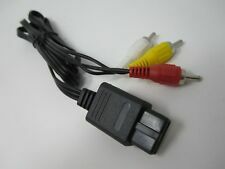 With standard for N64 input connector, video output connector and 2 audio output connectors. Compatible: for Nintendo N64. Net weight: 21g. AV to TV cord: let you connect your Nintendo 64 console with TV or monitors via the AV in socket, provides composite video and audio output for viewing on a TV. NINTENDO 64 N64. AV lead 180cm. 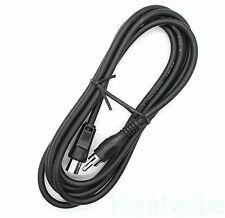 UK 3 Pin Plug with TV Lead. 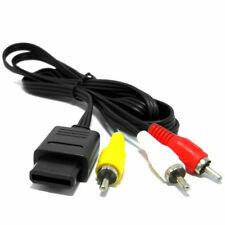 Features: 100% brand new and high quality Replace your broken or missing N64, SNES, NGC or Gamecube AV cable. This lead improves the audio and graphics over the original Nintendo RF cable and will connect your console to almost any modern TV with a Scart or RCA input. 1. Composite AV Cable. View Our Categories. This is essentially new and unused, complete with the instructions and everything still in their original bags. Due to the age of this there is a small amount of shelf wear on the edges of the box, however this is very minor. These high quality screened cables are ideal for modern HD and Smart TV's. 3 Molded RCA composite signal -red audio right,white audio left,yellow video. Compatible with UK PAL Nintendo consoles. Moulded Nintendo video port plug with strain relief. Condition is Used however in very good condition as per pictures. SmartPhone Accessories. Tablet Accessories. Garmin Accessories. Fitbit Accessories. 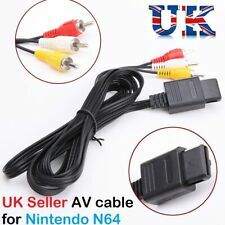 Nintendo 64 N64 - Scart TV Cable AV Lead UK/PAL - NEW! Multi-region Dreamcast consoles. Would always buy again.bandilini (23 ). After cleared funds have been received. Very Very good!!! A luke6336 (105 ). Much better sound and picture quality than RF and no more tuning in! 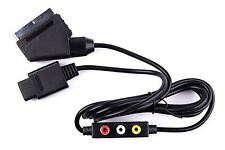 Nintendo 64 N64 AV Cable Cord RCA Composite Audio Video. 100% new and high quality generic AV Composite Cable for Nintendo 64/NGC/SFC. 3 RCA composite signal (red/white: audio, yellow: video). Moulded Nintendo video port plug with strain relief. AV Nintendo N64 Gamecube & SNES Pal AV Lead Brightness issue solved. AND FULLY TESTED 100%The screen shot's are picture'sN64 LYLATWARS with the brightness issue and then after modification showing NORMAL BRIGHTNESS. Most of the leads advertised Don't have the resistor in, they are made for Jap Asian NTSC consoles,where the resistor is in the machine not the lead. Cable Length:170 cm. Connects from the console to the TV and transfers Audio & Visual analog signals. Compatible with the Nintendo 64 only, this extension cable is NOT suitable for any other Nintendo console. - Simple plug and play operation. - Enjoy extra freedom and space when gaming. View Our Categories. Made for PAL - our colour sync av cable displays colours correctly on PAL consoles. - Premium quality connectors and wiring for picture quality. Add to Favourites. View Our Categories. This cable is tested and working on a PAL N64 system, but I cannot confirm that this will work on an NTSC N64 system. This cable does. DO NOT BUY THIS CABLE. 1.8 Metres of flexible cable Moulded Nintendo video port plug with strain relief Scart male 21-pin plug Stereo audio The scart cable connects your Nintendo and your television set and enables the RGB video signals for improved video output High transmission rate, superior picture quality It's a RGB video cable for: Super Nintendo N64 NGC SNES Cable Length 180cm Suitable for Super Nintendo N64 NGC SNES, PAL Super Nintendo Brand Unbranded/Generic MPN BT758093136204 EAN 758093139540. Brand New and Quality AV Lead Composite RCA Video Cable for N64, Gamecube & SNES Super Nintendo Replace your broken or missing N64, SNES or Gamecube AV cable. This lead improves the audio and graphics over the original Nintendo RF cable and will connect your console to almost any modern TV with a Scart or RCA input. 1. 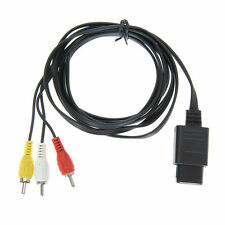 1 x 1.8m AV Cable for NGC / N64 / SNES Universal. 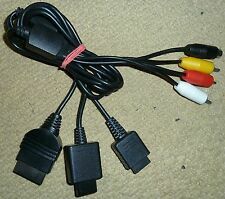 Connector: 1 x Yellow AV interface, 1 x Red AV interface, 1 x White AV interface, 1 x Port for N64. Material: ABS shell. We will always here to solve them for you. Stereo sound. Much better sound and picture quality than RF and no more tuning in! 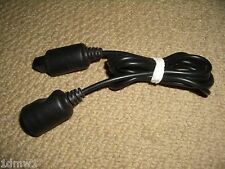 1 x 1.8m AV Cable for NGC / N64 / SNES Universal. 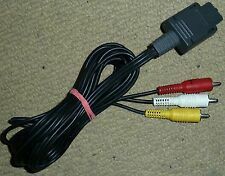 Connector: 1 x Yellow AV interface, 1 x Red AV interface, 1 x White AV interface, 1 x Port for N64. We will always here to solve them for you. It won't help the problem to be solved. Product picture is for reference only. We don't hold any responsibility to the color difference and will not accept about such related complaint. Cable Length: 1.8m. Weight: 84g. -Made by Third Party. TESTED - IN GOOD WORKING ORDER. IN VERY GOOD CONDITION. 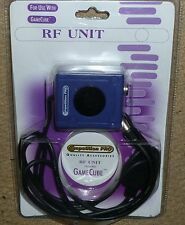 NINTENDO GAMECUBE NINTENDO 64 N64 RF TV AERIAL CABLE LEAD ADAPTER CONNECTOR NEW! Includes: RF Adapter with RF Cable.